The volume has a unique perspective in that the chapters, the majority by world-class physicists and astrophysicists, contrast both mainstream conservative approaches and leading edge extended models of fundamental issues in physical theory and observation. For example in the first of the five parts: Astrophysics & Cosmology, papers review Bigbang Cosmology along with articles calling for exploration of alternatives to a Bigbang universe in lieu of recent theoretical and observational developments. This unique perspective continues through the remaining sections on extended EM theory, gravitation, quantum theory, and vacuum dynamics and space-time; making the book a primary source for graduate level and professional academics. Volume 3 of The Enigmatic Photon develops the theory and practical applications of the B(3) field. 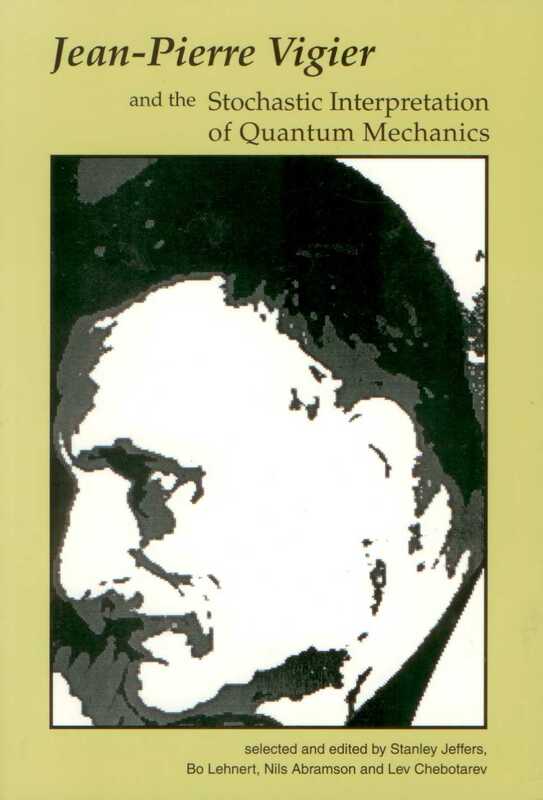 The opening chapters are based on the Dirac equation of a single fermion in a circularly-polarized electromagnetic field, an equation which defines the way in which B(3) interacts with matter. These chapters predict the theoretical possibility of nuclear magnetic resonance at infrared and visible frequencies. The third chapter considers the optical Aharonov--Bohm effect due to B(3), and suggests a mechanism for action at a distance in electrodynamics. Subsequent chapters discuss the radiation theory of B(3) and relate it to the theory of fine photon mass. 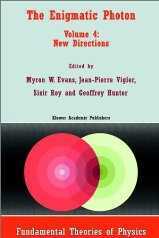 The final two chapters treat the theory of B(3) in cosmology and summarize future experimental developments. This book is a sequel to Volume 1, The Field B(3), which presents the first systematic description of the fundamental magnetizing field of electromagnetic radiation and Volume 2, Non-Abelian Electrodynamics, which deals with the development of the theory of the Evans--Vigier field B(3). Audience: This book will be useful to researchers whose work involves nuclear magnetic resonance. This volume establishes the fact that electrodynamics is by no means a completely understood theory by bringing together several in-depth review papers from leading specialists. The major portion of the volume is built around the nonlinear structure which leads to the B(3) field introduced in the previous three volumes published. Audience: Specialists, graduate and senior undergraduate students in physics, chemistry and electrical engineering. This book is a sequel to The Enigmatic Photon. Volume 1: The Field B(3) (Kluwer Academic Publishers, 1994), which presented the first systematic development of the fundamental magnetizing field of electromagnetic radiation: the field B(3). Its 12 chapters collectively describe the properties of B(3) in a vacuum and in the interaction of light with matter. 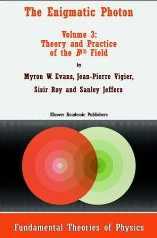 The present volume deals with the development of the theory of the Evans--Vigier field B(3). It opens with the derivation of the novel field B(3) from the Dirac equation of relativistic quantum field theory. The existence of B(3) in the vacuum means that the gauge group of electromagnetism becomes 0(3), the group of rotations. This is non-Abelian, and so requires a self-consistent development of the vacuum Maxwell equations themselves. The role of B(3) is discussed in unified field theory and quantum electrodynamics. The classical vacuum field B(3) is a novel, fundamentally important feature of electrodynamics which indicates that the particulate photon carries mass, thus settling a longstanding debate in favour of protagonists of photon mass. For researchers and graduate students interested in the theory of electromagnetic radiation. 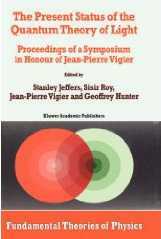 This volume contains the proceedings of a symposium held in honour of Jean-Pierre Vigier at York University, Toronto, Canada, in August 1997. The topics of the contributions range from quantum mechanics and its interpretation, to particle physics, electromagnetic theory, relativity and gravity, and the relationship between inertia and the zero-point electromagnetic oscillations that constitute the vacuum. The fifty-two articles are arranged under the following categories: astrophysics-cosmology, the Aharonov-Bohm effect, electrodynamics, gravitation and inertia, light and photons, mathematical physics, particle physics and quantum theory. Audience: This book will be of interest to graduate-level students and researchers. 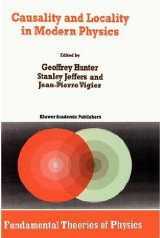 Contains the proceedings of a symposium held in the honor of Jean-Pierre Vigier at York University, Toronto, Canada, in August 1997. Topics include those ranging from quantum mechanics & its interpretation, to particle physics, electromagnetic theory, relativity & gravity, & the relationship of inertia & zeropoint electromagnetic oscillations in a vacuum. Volume 1 presents the first systematic development of the fundamental magnetizing field of electromagnetic radiation: the field B3. The book has 12 chapters which collectively describe the properties of B3 in a vacuum and in the interaction of light with matter. 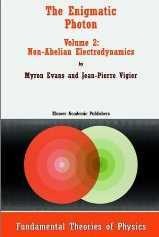 Volume 2 deals with the development of non-Abelian, or O(3), electrodynamics in which B3 is incorporated systematically. For researchers and graduate students interested in the theory of electromagnetic radiation.